PHOTO: Allen Ramsey, DWCPhoto.com. Highlands freshman Ali Gessner (13) snaps off the game-winning goal against Newport Central Catholic with eight seconds left in the second five-minute overtime frame. Gessner's 10th goal of the season lifted Highlands to its first regular season win over NewCath since 2007. It seemed like the hosts put up shots from every angle. But no matter the location, the Highlands Ladybirds soccer team could not become the first team to put one past Newport Central Catholic Lady Bred fourth-year starting goalkeeper Meg Martin. That's until the clock in the second five-minute overtime frame ticked below double-digit seconds from penalty kicks in the 36th District campaign. Martin turned away the first nine Ladybird shots on goal. But on the last rush forward with less than 30 seconds left in overtime, Martin blocked away a Highlands shot, but the ball did not clear the 18-foot box. Highlands freshman Maria Wiefering tracked it down from the left of the goal and found the team's leading scorer at more than the right time. Freshman Ali Gessner took it near the top of the box and smashed it past Martin for the game-winner giving Highlands the 1-0 victory. "The forwards were trying to take their runs, get through and take the defense to the other side," Gessner said. "We were trying everything. Finally, Maria Wiefering played a ball to me in the air. I took it, touched it and shot it. We worked a lot on films (Sunday) and talked about what we needed to do better and we fixed those things." Gessner leads the team with 10 goals this year. Gessner also has four goals adding up to a team-high 24 points on the season. That marked the third assist of the season for Maria Wiefering. The Ladybirds (11-1-1) bounced back from their first loss of the season Saturday, 2-0 to Simon Kenton in the title game of the Lexington Catholic Cup. Most of all, Highlands moved to 2-0 in 36th District action with its first regular season victory over the Lady Breds (9-1-1) in nine years and 5-0 in 9th Region action. "We had an intense film session (Sunday)," said Brian Wiefering, Highlands Head Coach. "It was x's and o's. I walked out of film session realizing it was probably my fault how unorganized we were in the last few games. We probably should have had that film session a little earlier where we went back to the basics of a few things. I always get ahead of myself and we were putting together snazzy plays where it was like, 'Wait a minute. We're worrying about C and we're kind of forgetting about A and B, which are the basics.' I carried the last loss on my shoulders. It was more than a few that forgot the basics. (On Monday) they showed that and hopefully, we can build from this." The last time Highlands beat NewCath in the regular season came on Sept. 3, 2007 by a 2-0 score during the senior campaigns of former Ladybird greats like Caitlin Beck and Laura Painter-Cogswell. Highlands has beaten NewCath five times since that game in the postseason on its way to eight district championships in 10 years. Highlands owns quality wins over the likes of Owensboro Catholic, West Jessamine, Ryle and Louisville Sacred Heart this year. But the Ladybirds knew they had to do better against main arch-rivals NewCath and Notre Dame this year after going 1-3 against them last year including losses to NewCath in the 36th District title game and Notre Dame in the 9th Region semifinals. The Ladybirds rose up to the challenge of returning to ball-possession soccer leading to more chances and fewer offside penalties instead of booting the ball up the field hoping to outrun opponents. Opposing goalkeepers often pick up balls booted down the field inside the box and boot it the opposite direction. Highlands junior Kylie Stava credited senior midfielders Kiersten Clukey, Claudia Hils and senior forward Sydney Ossege for leading the charge there. "It was incredible. Our forwards were checking back into space instead of doing straight runs and us playing straight over the top," Stava said. "They were running diagonal. Our entire midfield was seeing the diagonal passes. (Clukey and Hils) pass the ball so well and they help on the switches. (Ossege) has gotten better throughout the year. The seniors really set a good example for us younger kids." Highlands outshot NewCath, 21-8 including 10-5 on goal. The Ladybirds received another great game from junior goalkeeper Olivia McQueary. McQueary recorded five saves as the Ladybirds recorded their 11th shutout on the season. Highlands has outscored the opposition, 43-3 on the season. NewCath outscored its first 10 opponents, 50-0 including the All "A" 9th Region championship. The only team to tie the Lady Breds was Ryle, 0-0 on Aug. 29. The game had its usual physical play with NewCath committing 13 fouls to 10 for Highlands. 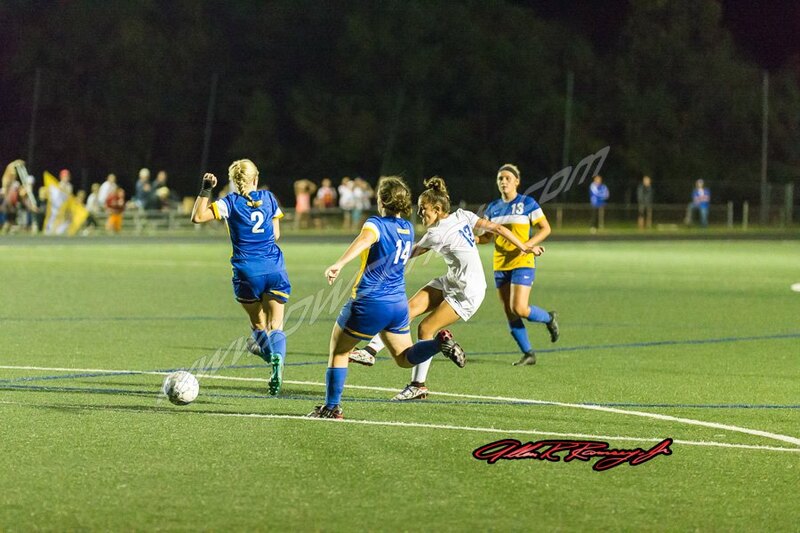 But the only yellow card came against the Lady Breds in the second half. NewCath came in with weapons all over the field. Senior Taylor Tolle led the way with 16 goals. But Highlands held its ground in the back led by the likes of seniors Annalee Brewer, Karolyn Lukjan and sophomore Hannah Gish. "That's a tough one because if you only worry about Taylor and she's a great player, you have (junior) Jenna Ahlbrand. You have (Kara) Zimmerman," Coach Wiefering said. "If you go down the middle of that field, you have (Martin). You have (senior) Ruthie Barth. That is why they're a great team. All their other players work so hard. I hate to say it's just those girls because it's not. They are the third-ranked team in the state (in the Maher Rankings) and they definitely deserve that. Some people say their schedule is not that great, but they are the third best team right now." Highlands had two corner kicks in the first half but could not convert. Clukey broke free for a shot in front of the goal in the 43rd minute, but Martin dove to her left for the tough save. Sophomore Gwen Gorman got off a nice shot with 1:56 left in regulation, but it went right to Martin. Gessner had a chance to score with 10 seconds left in the first five-minute overtime frame. But Martin snatched the header. Highlands and NewCath tied 1-1 in the junior varsity game. Freshman Kelsey Miller scored the goal for the Ladybirds. The Ladybirds do not play again until Saturday at Beechwood (7-6). Game time is 1 p.m.